Hold onto your hats and lace up your boots; we’re off on a fashion adventure! 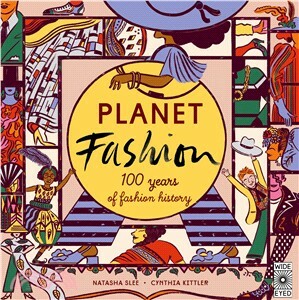 Travel through 25 scenes in fashion history, circling the globe with your two young stylish travel companions – one boy and one girl, dressed the part in every picture. Each lavishly illustrated scene captures the mood and style of a unique time and place, accompanied by a trove of fashion history facts. Your journey begins over one hundred years ago, twirling around the ballroom in gowns and tailcoats. Travel on to dress up in Oriental silks to see a performance of the Ballet Russes, shimmy down in the flapper fashion of the Harlem Renaissance, fling your feather boa as you schmooze with movies stars on the Hollywood red carpet and glue your hair into spikes as a London punk in this celebration of fashion and culture. Each vibrant, style-defining setting shows an array of characters showing off the distinguishing fashions of the time. Captions point out key fashion features, accessories and cultural influences – like the cycling bloomers of the active and career-driven New Woman at the start of the twentieth century, the morale-boosting felt hats worn during the Second World War and the plastic sunglasses inspired by space goggles from the Space Race era. Fact boxes give the time, place, key designers, and trends in silhouettes, hemlines, and sleeves for each fashion scene. Use the timelines at the back to see how historical events intersect with the evolution of fashion. One timeline summarizes the formative events of the twentieth century and three others highlight trends in shoes, hats and bags. A Can You Find? page gives you motivation to study the scenes even more closely. Can you find a waiter dropping his tray of coffee on the streets of Paris? And a pair of roller skates at the dazzling disco jam?